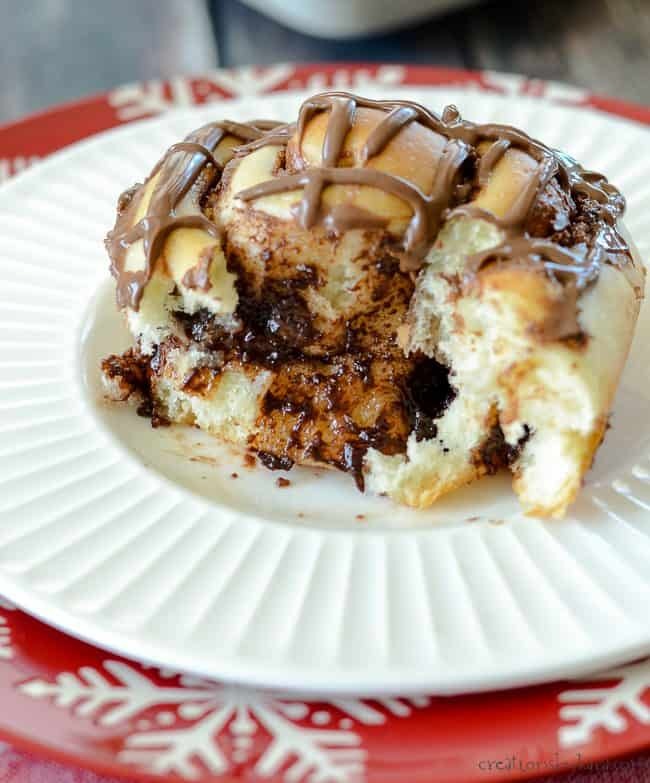 Nutella Rolls – sweet rolls filled with creamy Nutella and chocolate chips, then drizzled with more Nutella. 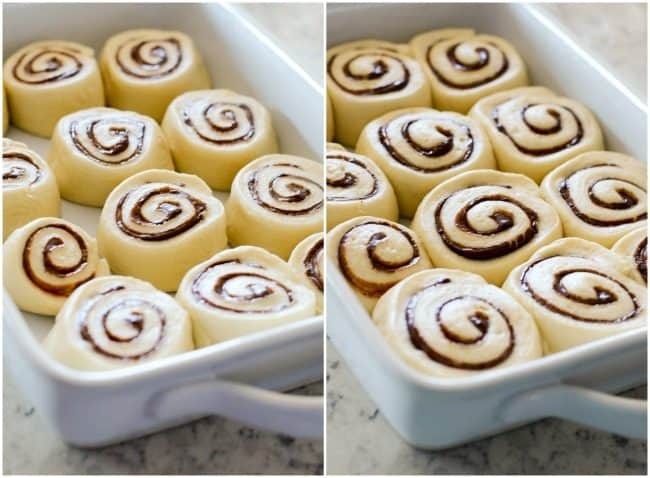 Chocolate fans of all ages will go crazy for these sweet rolls! 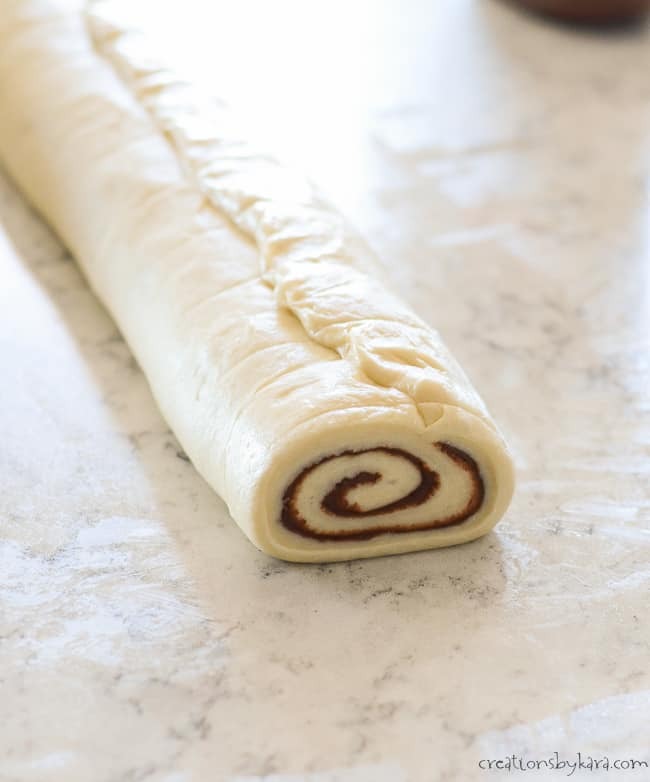 My mom taught me how to make cinnamon rolls when I was a teenager, and making sweet rolls has been a favorite of mine since then. Nowadays I am always looking for new flavor combinations for sweet rolls. I came across a recipe for overnight nutella rolls at The Taylor house. Everyone in my family is crazy about Nutella, so I knew I needed to make them. We needed sweet rolls asap, so I did not do an overnight version. I made a few other changes to the recipe, mainly the frosting. I figured why mess with frosting when you could just have straight Nutella. I figured if it’s good right out of the jar, it had to be pretty spectacular drizzled over a warm sweet roll. Oh baby, was it ever! If you are familiar with the process of making cinnamon rolls, these are pretty similar. 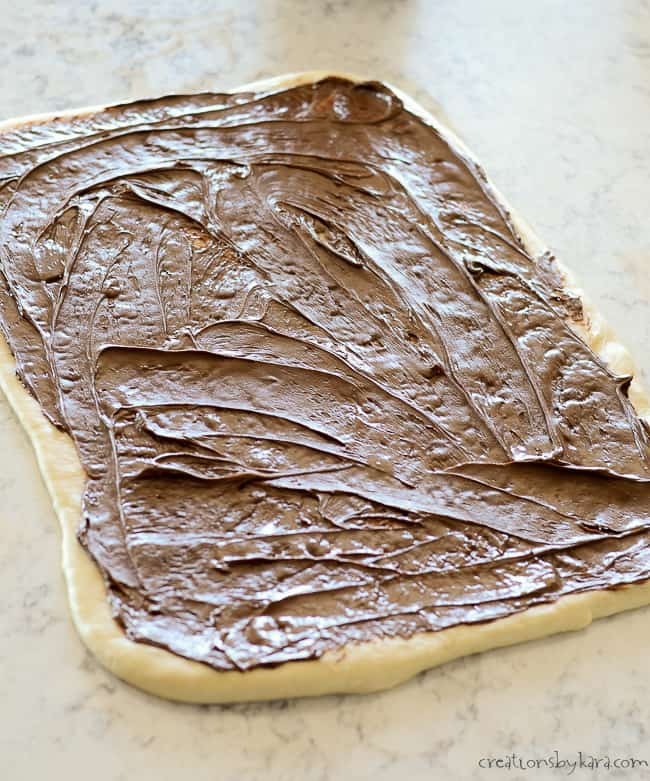 After you roll out your dough into a rectangle, you melt together some butter, chocolate chips, and of course Nutella. Just spread that chocolatey goodness over your dough. Roll the dough up lengthwise, and pinch the seam together to seal. Cut your dough into 12 slices and place them in a greased 9×13″ pan. Cover with plastic wrap and let rise till doubled, usually 45-60 minutes. After the dough is all nice and puffy, you want to bake them at 350° till they are nice and golden brown. They will puff up even more in the oven. Don’t they look glorious? To take these babies to the next level of yumminess, you drizzle the tops with Nutella. I just scooped about 1/4 cup of Nutella into a ziplock bag, then squeezed it in my hands a bit to warm it up. Then I snipped a hole in the corner and drizzled away. 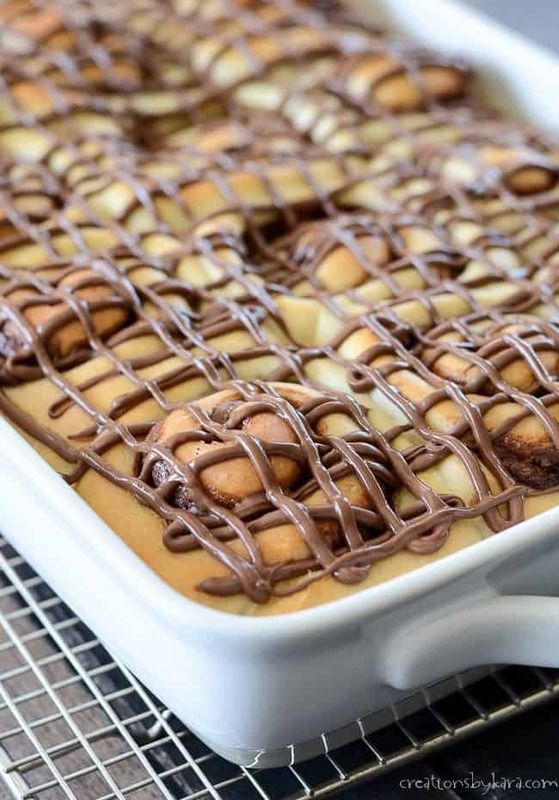 If you like Nutella half as much as my family does, you are going to love these Nutella rolls. They are soft and pillowy and filled with decadent chocolate filling. Nutella drizzled over the top is the perfect touch I think. So simple, but seriously decadent. Make sure you have a tall glass of milk ready! -You want a dough that is soft but not sticky. When it no longer sticks to the side of the bowl, it’s usually ready. -A good rolling pin makes roll making much easier. I bought this marble rolling pin a couple years ago, and wish I would have got one sooner! -I always roll out my dough on a greased countertop instead of using flour. I don’t want all that flour ending up in my rolls, making them dry! -I cut my sweet rolls with dental floss instead of a knife. Just slide the floss under the roll of dough, cross the ends over each other and pull in opposite directions till you cut through the dough. No squished rolls! 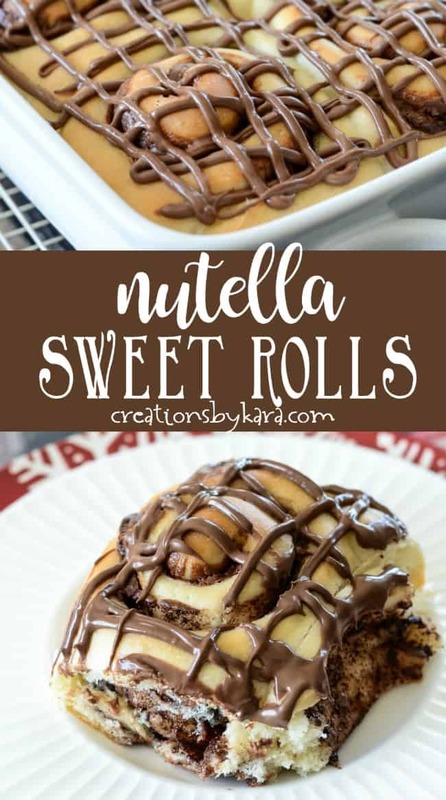 Give these nutella rolls a try and let me know what you think! 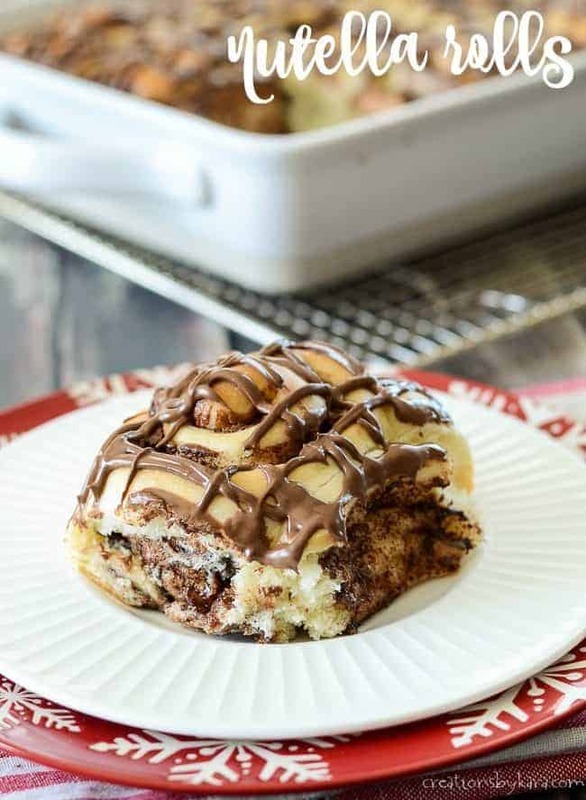 Decadent sweet rolls loaded with creamy Nutella. Spray a 9x13" pan with non-stick spray, set aside. Stir together yeast, warm water, warmed milk, and sugar in a Bosch or Kitchenaid mixer. Add the egg, salt, oil, and about 2 cups of the flour. Beat till smooth. Beat in enough flour to make a soft dough; cover and let rest 5-10 minutes. Melt butter in a glass bowl in the microwave. Add the chocolate chips and stir to melt. Stir in the Nutella. If it seems too thick, you can heat it in the microwave for a few seconds. On a counter that has been sprayed with non-stick spray, roll dough out into a rectangle about 10x15". Spread the nutella mixture evenly over the dough. Roll the dough up lengthwise and pinch seam to seal. Use floss or thread to cut into 12 slices, and place in your prepared pan. Cover and let rise till doubled, about 45-60 minutes. Uncover and bake at 350° for 25-30 minutes or till golden brown. 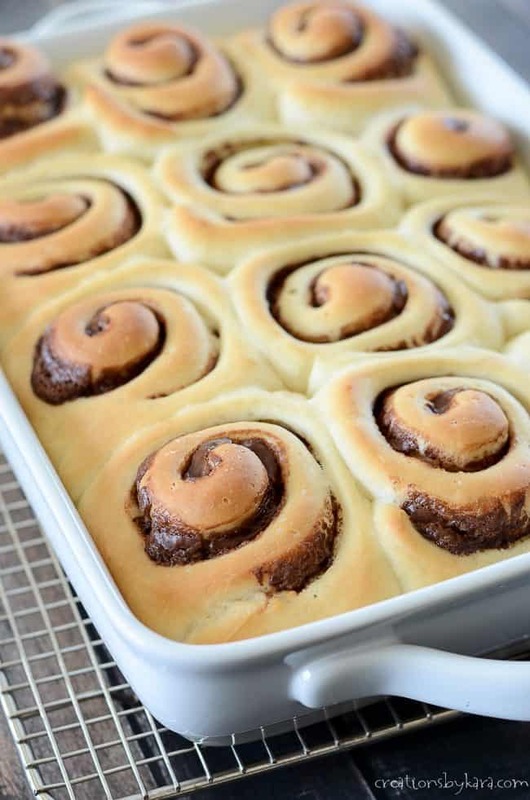 Drizzle warm rolls with Nutella. 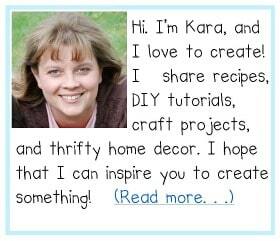 To see all my roll recipes, click HERE. Could you substitute the milk with plant milk (almond, soy, etc)? I’ve never tried it, but I think it should work just fine! YES! 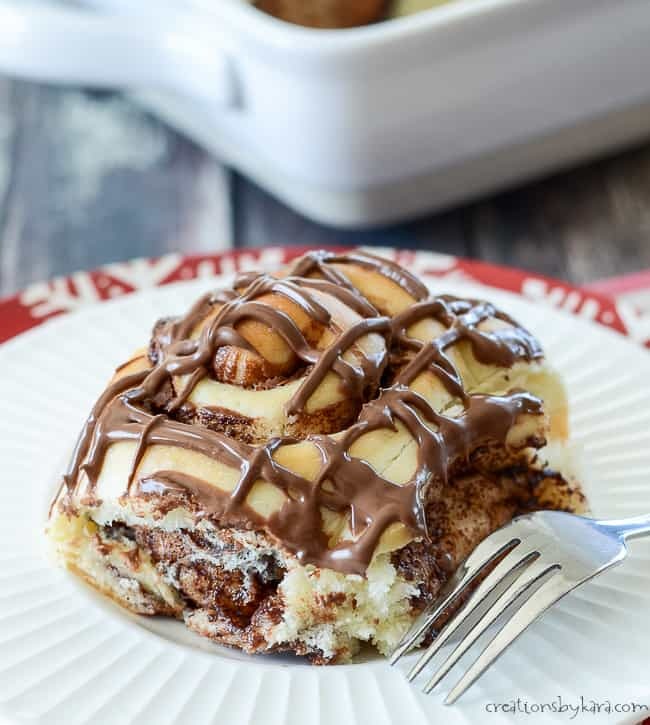 My daughter loves Nutella and will totally love these breakfast rolls! These are my dream dessert! Nutella is the best! I can’t wait to stuff my face with these! Totally agree. Nutella is seriously addicting! I think I’ve died and gone to heaven! These are so indulgent and that’s just the word I’m looking for when I’m wanting to bake something. Yum! These look incredible! 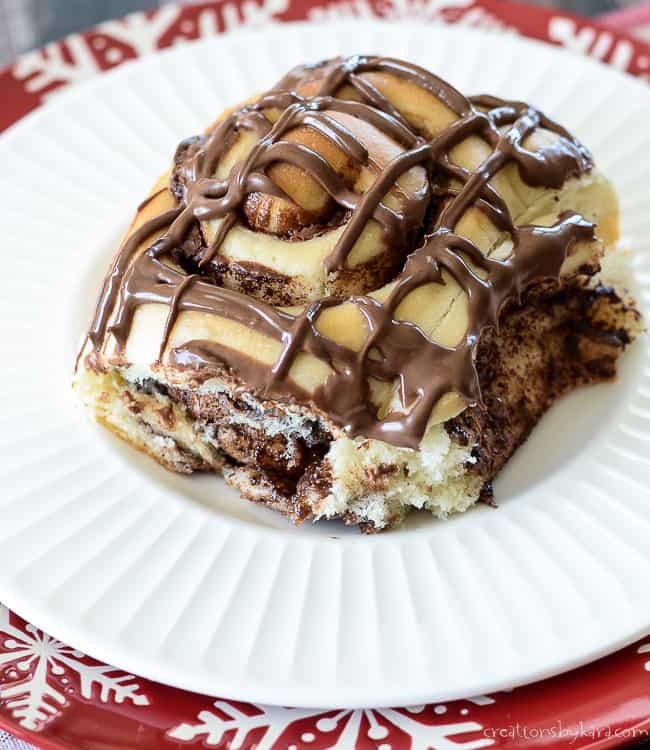 Nutella and Cinnamon Rolls married together! What more could a girl ask for?